SHOC receive the prestigious Queens Award for Voluntary Service. SHOC|News|SHOC receive the prestigious Queens Award for Voluntary Service. The presentation ceremony for the coveted Queen’s Award for Voluntary Service took place at Wellington College, Berkshire on December 13th. To be considered for the award, SHOC had to demonstrate that it is supported, and respected by the local community as well as by the clients who benefit from the service. The award recognises the outstanding contribution that SHOC makes to the Slough community. Dubbed the MBE for voluntary service, SHOC was one of 112 charities across the UK to receive the award this year and one of 7 from Berkshire. The award was presented by the Lord Lieutenant of Berkshire, the Hon Mrs Bayliss, with an enthusiastic introduction from Mr Gordon Storey, an Award panel member. The Mayor of Slough, Christine Small, was also present. 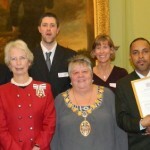 SHOC was also awarded the “Mayor of Slough Charity of the Year” in 2011.